Humuhumu and I went into town yesterday to run errands. We stopped for elevenses at a new hipster cafe. 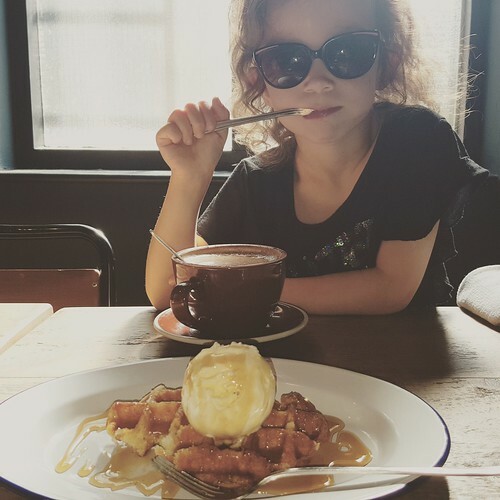 A double macchiato for me, hot chocolate for her, and we shared a waffle with vanilla ice cream and maple syrup. This entry was originally posted at https://nanila.dreamwidth.org/1187833.html. The titration count is at .0 pKa. She looks very grown up. That is such a fun photo. And I'd sure dig that waffle right now. Oh, the waffle was so good. We hoovered it up.